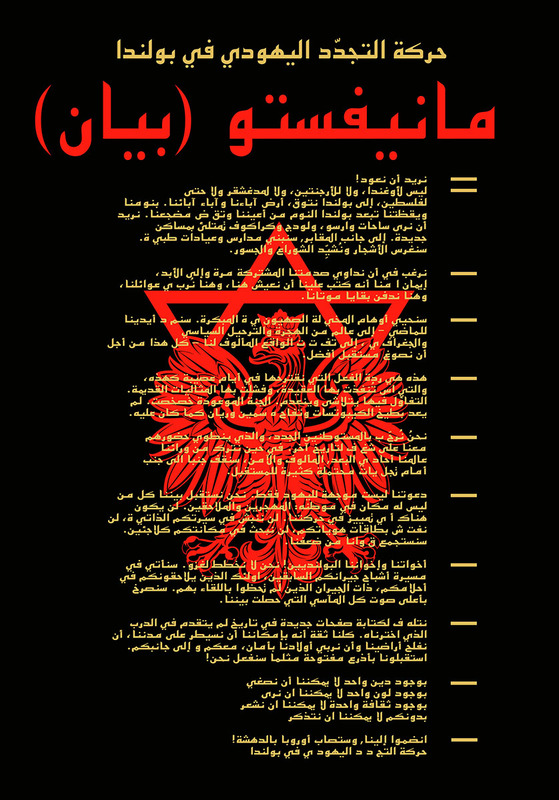 Jewish Renaissance Movement in Poland, JRMP manifesto in Arabic, 2012, design courtesy Fontarte (Magdalena Frankowska, Artur Frankowski), courtesy Yael Bartana. Ruch Odrodzenia Żydowskiego w Polsce (Jewish Renaissance Movement in Poland) was founded by the Israeli artist Yael Bartana against the background of the Polish-Jewish video trilogy of Mary Koszmary (Nightmares) (2007), Mur i wieża (Wall and Tower) (2009) and Zamach (Assassination) (2011). The films are a set of “exercises in political imagination,” the story of a movement seeking to return three million Jews to their ancestral homeland. Themes of the Israeli settlement movement, Zionist dreams, anti-Semitism, the Holocaust, and the Palestinian right to land are interwoven in Bartana’s project. Laying the foundations for a real socio-political movement was an integral part of Bartana’s project from the start (see: 1:1 scale). As a concept, the Jewish Renaissance Movement in Poland is a form of group psychotherapy in which national demons are awoken and exposed to daylight. Apart from the complex picture of Polish/Jewish relations, this is a universal story about the problem of cultural integration in an unstable world, and the willingness to accept the alien amid political and economic turbulence. Bartana examines reactions to the return of the “former invisible neighbour” and resurrects forgotten motifs of alternative locations for the state of Israel (such as Uganda), which were once considered by Zionists. The report presented in exhibition consists of a manifesto issued by Jewish Renaissance Movement in Poland.